In nature, plants mainly increase in number and diversity by the distribution of their seeds or spores, carried far and wide by natural agents like wind, water, birds, and animals. Clumping and sending out stolons are other natural ways of plant proliferation employed by grasses and many shrubs. Man has also contributed to this by actively propagating plants of ornamental and agricultural value, which can be done in a variety of ways. Cut out a spore-bearing leaf and place it in a paper bag to collect the brown spores. Prepare a moist, sterile, media in a tray and sprinkle the spores on it. Cover it with a clear plastic sheet or glass to retain the moisture. Place in a bright place away from direct sun. The heart-shaped prothalli that appear after several weeks or even months will eventually produce baby ferns. Once they put out a few true leaves, transplant into several containers. 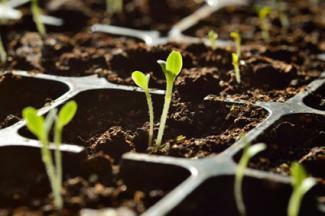 Propagation by seeds is the easiest way to obtain a large number of plants economically. Sexual propagation through seeds is a widely used method, but not all plants produce viable seeds. It also results in unpredictable and, in many cases, undesirable genetic variations in the resultant plants. Most annuals in the garden are propagated by seeds. Starting the seeds indoors gives the seedlings a head start before they are planted in the target location. 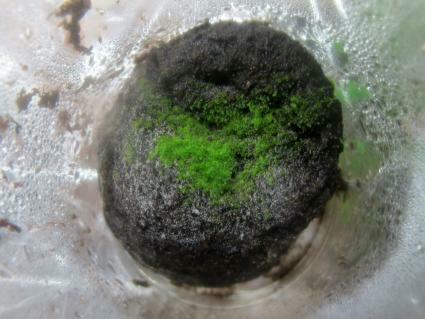 Seeds are sown in a sterile rooting medium in a tray or individual containers. The depth of sowing should equal to double the size of the seed. Keep in shade until seedlings emerge. Fine seeds are sprinkled on the surface as they need light for germination. If weather conditions permit, sowing the seeds directly where they are to grow in the open ground saves a lot of time and labor. Most farmers follow this method with grains and vegetables. In fact, peas and root vegetables, like carrots, do best when sown in situ. Prepare the ground is by loosening the soil and mixing in compost and other soil conditioners. When all danger of frost has passed, plant the seeds in drills at regular intervals. Seeds of grass can be just scattered over the prepared ground. Water the area to maintain the moisture levels required for germination. Simply dividing large clumps or rooting cuttings of various plant parts can produce several baby plants vegetatively. Obtaining true-to-type plants is the main advantage of vegetative propagation, especially in the case of hybridized plant varieties. Clump-forming plants like daylilies and irises can be divided for planting elsewhere. 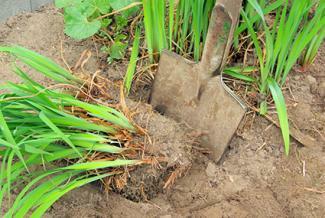 Dig up the clump with as little damage to the roots as possible. Cut off pieces with a sharp knife or pull the clump apart to have many sections with a few roots attached. Bromeliads, hens n' chickens, and aloes sprout offsets from the main stem. Cut them off with a sharp knife pot up to get new plants. Many rosette-forming succulents are propagated from whole leaves. Remove the lower leaves by gently twisting them of the stem. Allow them to dry out for a few days before laying them on a tray with cactus soil. Keep the medium nearly dry to prevent the fleshy leaves from rotting. Roots grow into the soil from the base of the leaves, followed by tiny plantlets. Pot up the new plants when they have developed a good root system. To propagate sedums, African violets, and peperomias, cut out a mature leaf with an inch and a half of petiole attached to it. Insert the cut end of the petiole into a sterile rooting medium. Plantlets can be potted when they are big enough. A single leaf of the snake plant Sansevieria can be cut into several two inch sections and the base end of each can be inserted vertically into the rooting media. The resulting plantlets may not have the same variegation though. New plants can be grown from a Begonia rex leaf if the veins on the underside are cut with a sharp blade before laying the leaf right side up on the surface of rooting medium. Sections containing portions of the vein can be planted vertically too. Soft stem cuttings are ideal for some plants, while others grow better from woody stems. Tip cuttings with the growing terminal buds can be rooted at any time, while woody stem cuttings are best taken during the period of dormancy. After removing the cutting from the parent plant, dip its base end in rooting hormone powder before inserting into the moist rooting medium. Keep it in a bright place away from direct sun. Enclosing the cuttings in clear plastic will provide the right humidity. The stem is first rooted before cutting it from the parent. Bend lower branches of shrubs and cover a portion with soil after bruising the area to promote rooting. In mound layering, soil is heaped onto the base of a multi-branched shrub so that several branches will develop roots. Air layering involves removing a portion of the bark on a branch and covering the area with a pack of moist sphagnum moss. When roots develop, the branch is cut off below the layered area and potted up. Single buds or small branches of a good variety fruit trees are grafted on to rootstocks to get superior plants. Remove a bud with a small portion of the surrounding tissue with a sharp blade and place it on the stock plant after removing a similar portion from its stem. Bind it tightly with grafting tape and remove the stem of the rootstock above the graft to promote the growth of the bud. Bulbs and corms and rhizomes are modified stems that grow underground. Separate the bulblets and cormlets that grow around the main bulb to make new plants. Propagate ginger, banana plants, yams, and rhizomatous begonia by digging up the underground stems and cutting them up into sections with one or more growing tips. Plants like lilac, clerodendrum, and passion flower are propagated from their roots. Dig near the plants to expose a healthy root and cut it out. Make several five inch sections, and plant the base end of each into rooting medium. Two inch pieces of smaller roots can be planted horizontally in the medium. Keep the containers in a dark place until buds begin to appear. Move to a bright spot as the shoots develop. 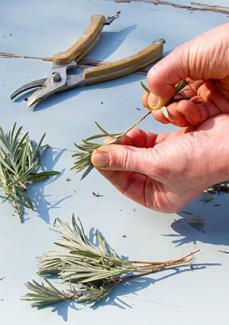 Snip off soft stem cuttings of lavender and stick them in the soil to get plenty of new plants. The lower branches of multi-stemmed plants can be layered by bending them to the ground and heaping soil on them to promote rooting. Unlike the leaves of many succulents that root easily, aloe leaves often rot to a sorry mess because of its high water content. They are typically propagated from pups that arise from the main stem. Separate each pup that has a few roots using a sharp, sterile blade and allow the cut end to dry up before inserting into well-draining medium. Water occasionally only as too much moisture will kill the plant. Hellebore are clump forming plants. Dividing each clump into two or more sections will give many new plants. However, hand pollinating the flowers is worth the effort as it often results in interesting combinations. Remove mature flowers with pollen and dust them on to the stigma of flowers that are about to open. Mark the pollinated flowers for collecting seeds. Sow the seeds immediately after harvesting as they lose viability fairly quickly. Hydrangea are easily propagated soft wood and hard stem cuttings, but tip cuttings are the quickest to root. Cut off the top five inches of the new shoots and remove the lower leaves. Dip in rooting hormone powder and insert into sterile rooting medium. Roots will develop in three to four weeks. Traditionally roses have been cultivated from cuttings taken after the flowers wither. Insert these semi-soft cuttings into moist medium for rooting. Transplant to site after new shoots develop. Strawberry plants send out runners in every direction which readily form plantlets, sending down roots. Separate the plantlets from the mother plant and pot up in individual pots. Root cuttings can be taken after tracing a healthy root to the parent plant. Sever the root with a straight cut. Make a slanting cut to get a six inch section. Insert the straight end vertically into the rooting medium. Suckers around a plant can be dug up with a piece of root attached and planted separately too. Stem cuttings also give good results. Propagating plants is extremely rewarding and allows you to expand your own garden or share with friends. Be sure to work with clean tools and remember that propagation will keep your perennial plants healthy and happy.